Don’t let ice, talus, scree, or mud stop you! Built to provide traction on slippery surfaces, microspikes can help you get a grip and keep on trekking. When you think of outdoor winter travel, your mind will possibly jump immediately to cross-country skiing or snowshoeing. But in popular recreation areas or areas with significant frequent temperature changes, you may run into the problem of icy terrain. If you’re hoping to successfully traverse these icy trails, you would do well to pack some microspikes. You can purchase microspikes from a number of different suppliers in a whole range of prices from cheap to not-so-cheap. In this post, we’ll compare the best brands to help you find the best microspikes for hiking. There’s a chance that you’ve heard of Yaktrax, microspikes (traction cleats), crampons or all three. And you may be wondering what’s the difference? And which one is right for me? All three of these devices are built to provide you with extra traction on slippery surfaces. 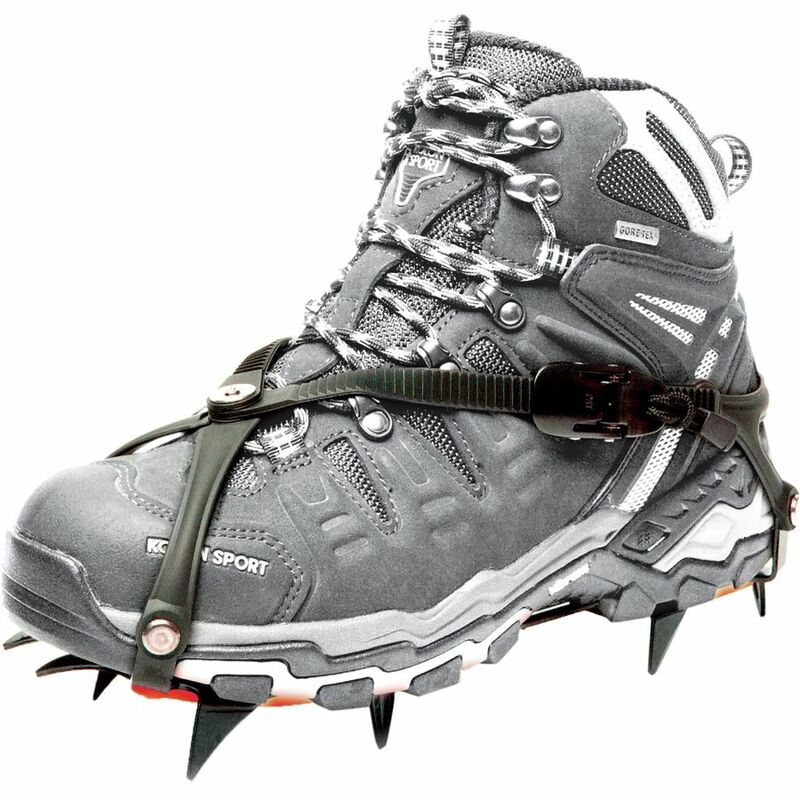 Yaktrax do so via steel coils whereas microspikes and crampons consist of chains and metal teeth that bite into the ground. Crampons generally have longer, more heavy-duty teeth than microspikes however there is some crossover and not really a hard line between the two. Yaktrax are geared more towards runners who want to be able to run normally in the winter time. And if you want to begin ascending steeper slopes or traversing glaciers, then you will start getting more into the heavy-duty crampon territory. But if your winter plans are more laid back and you’re planning on hiking fairly level, icy or packed trails microspikes are the way to go. There is some debate about exactly how much slope your microspikes can handle. 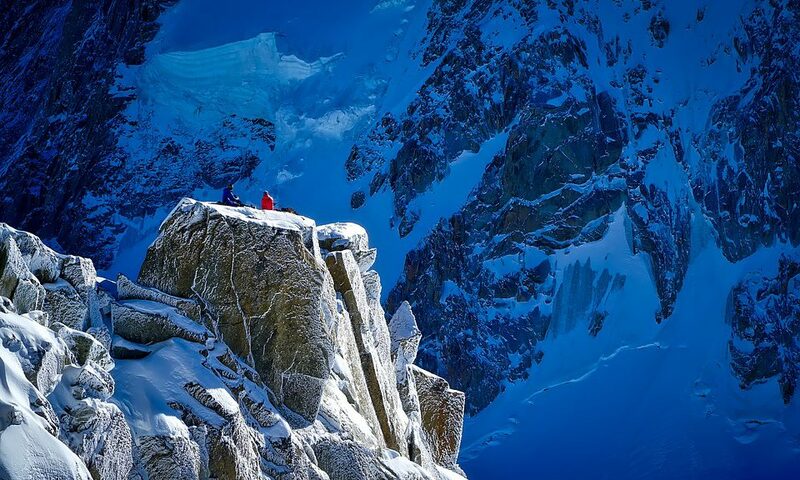 Some people will say that if there is any slope at all, you will need crampons. Others will tell you that they are comfortable with just microspikes up to moderate slopes. I suggest being mindful of your personal skill level, and risk threshold. Don’t overestimate yourself and remember, if your trail starts to get steep and you feel like your traction is lacking, you can always turn around. Which traction device is the best for you? We’ll leave the heavy-duty crampons for another day. Right now we’re going to look at some of the best microspikes (and similar products) for winter hiking. As you consider which ones you want to purchase, keep in mind the aspects that are most important to you. This may include price range, durability, ease of use, weight, etc. Kahtoola is undoubtedly the leading brand when it comes to traction cleats. In actuality, the word MICROspikes is the specific brand made by Kahtoola. MICROspikes are to traction cleats as Kleenex is to tissues or ChapStick is to lip balm. Many people use the word microspikes to encompass all similar products made by other brands as well. So if you’re looking for something tried and true, Kahtoola is an obvious choice. Kahtoola’s microspikes feature twelve 3/8 inch (0.95 cm) stainless steel spikes on each foot. The spikes are connected by flex chains which in turn, are attached to the elastomer harness that wraps around your shoe. The flexible harness allows you to easily secure the spikes to your shoes. The Kahtoola MICROspikes can accommodate all types of footwear including tennis shoes, hiking boots, and insulated boots. You can even use one pair on multiple sets of shoes. And they last for years! Wear yours on snow, ice, mud, scree, or talus and feel the AWD kick in on your feet. Kahtoola offers a 2-year warranty on this product. Best bargain: We found no significant price difference between vendors however you can score some reward dollars if you purchase on REI or Moosejaw. Admittedly this traction device goes by the name of crampon. However, they are quite similar in design to the Kahtoola MICROspikes, and they are one of the products that blur the line between microspikes and full-on mountaineering crampons. 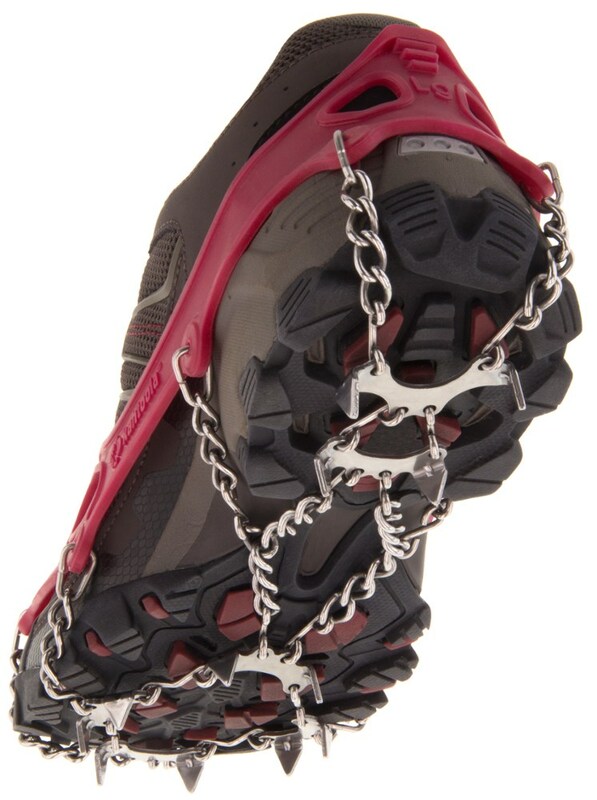 Hillsound trail crampons are made with carbon steel spikes, stainless steel chains, and an elastomer harness. They weigh a few more ounces than the Kahtoola’s but, at 1.5 cm (0.59 in) the spike length is slightly longer, which translates to a better overall grip. Due to an ergonomic plate system, you can wear this traction device with minimized foot and ankle fatigue. You might not even feel as if you’re wearing them! The Hillsounds are durable and can last you a long time with proper care. However, the Hillsounds do come second to Kahtoola when it comes to ease of use, as the Hillsounds are more difficult to pull onto your shoe, especially when your hands are clumsy or weak from the cold. The Unigear traction cleats are a huge bang for the buck. If the price of the above spikes are a bit more than you can handle, consider these babies for just about half the price of either the Kahtoola MICROspikes or Hillsound Trail Crampons. 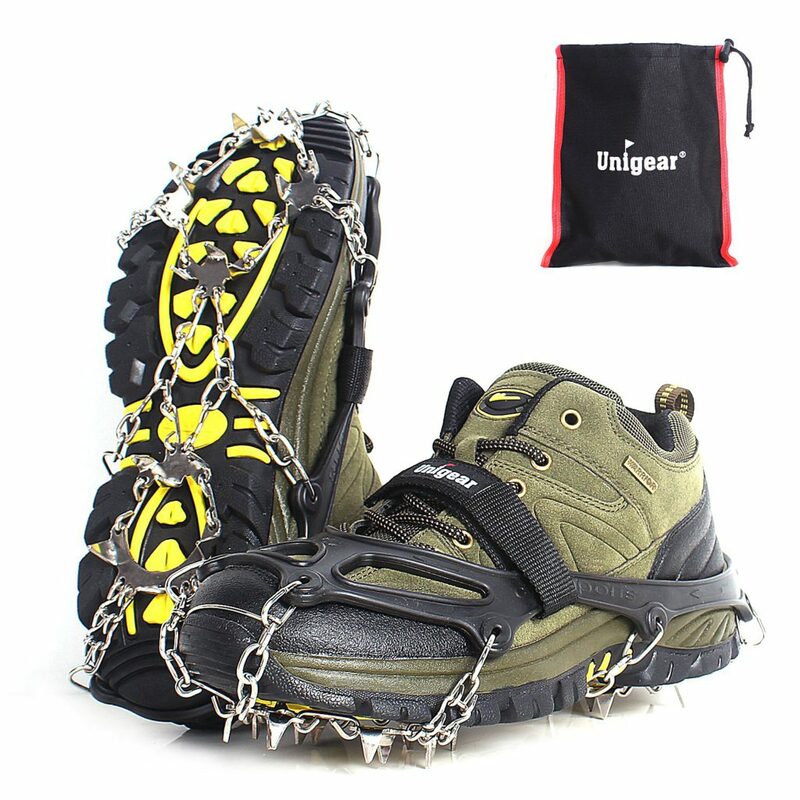 Unigear markets these cleats as ‘heavy duty crampons’ however that’s going a bit far as they definitely fall into the microspikes category. The spike length is a teeny bit longer than Kahtoola’s spikes, and they weigh a teeny bit more. They also feature 18 spikes per foot on the adult-sized device (13 for the kid’s size). The hooks on the elastomer harness make it just as easy to pull this device on and off your shoes, as the Kahtoola spikes. What’s more, the Unigear cleats have a loop strap that secures the cleats over the top of your shoe or boot as well. Unigear does not offer a warranty, however, they do have a 60-day guarantee where you can return your purchase for any reason within the time frame. So you better get out there and test them out as soon as you can! All three of these traction devices could serve you well during your winter adventures but, overall, my top picks are the Hillsound Trail Crampons because they offer the best traction for an excellent price. But if the weight or the price is too high, I’d say to go with the Kahtoola’s or the Unigear cleats respectively. Remember that if you’re looking to trek up some serious hills, these devices may not be good enough for you. I often see people complaining about their microspikes failing them when they’re side-hilling it all over the backcountry or trucking up steep grades. And the reason is that they’re trying to stretch them beyond the intended use. If you’re a diverse winter hiker, you may wish to purchase both microspikes and heavy-duty crampons and use whichever the conditions demand on any particular day. If you have any questions, comments, concerns, or personal testimonials leave them in the comments below and I promise I’ll get back to you! Yeah, I have to agree, the first thing I thought of when I heard winter sports was some kind of skiing in snow or snowboarding. Never heard of a microspike before now, sounds amazing though. I think it would make me feel much more secure on slick surfaces. Thank you for showing me this. I’ll be sure to look into them next time I do this! I have never thought or even tried hiking in winter before. But I think it might be best around this time since I hate bugs. I am going to give it a try, there are so many places by NYC that I can go and explore. I might go for Kahtoola. Is it easy to fit them to your shoes? How do you maintain the product? Do I need a special type of cleaner for these? Hello there. They are stainless steel so they are quite easy to maintain. Just make sure they dry completely after each use. You can oil them occasionally as well if you like. If you’re interested in getting started with winter hiking be sure to check out Snow Hiking Equipment – What to Bring on Your Winter Adventure and Best Winter Hiking Socks to Keep Your Feet Happy This Season. What an interesting article. I don’t do Winter hiking, or really much hiking at all, but if I were to do some, this article explains exactly what I would need! I do have a friend that does a lot of this kind of stuff, so I may need to pass this article on to her. I know she would enjoy it as well! Hi Angie! Please do pass it on to anyone who may be interested. We hike around the hills and mountains of South West Wales – we’re very lucky to have some of the best rural hiking tracks in the world right outside our door, with a huge variety. Snow and ice are not usually a problem for our area due to the rain, but loose dirt and mud certainly are. Which out of the three microspike examples you’ve covered here would be best for our area, best for muddy inclines? Any of these three options would work for muddy inclines. Though the Hillsounds may be a bit overkill because the spikes are the largest. Microspikes look really cool and helpful for those winter months when conditions are slippery. They seem a little bulky, can’t you buy shoes that have spike already built in? Are they hard to get on and off? When the going gets tough the microspikes are not suitable due to the size of the spike I guess! Have you had any falls while testing these particular spikes? I will have to road test these myself one day to see how they work in different terrain. It wouldn’t be good to hike in shoes with spikes built in, because then you lose all the versatility. You only want to use the spikes when you really need them. 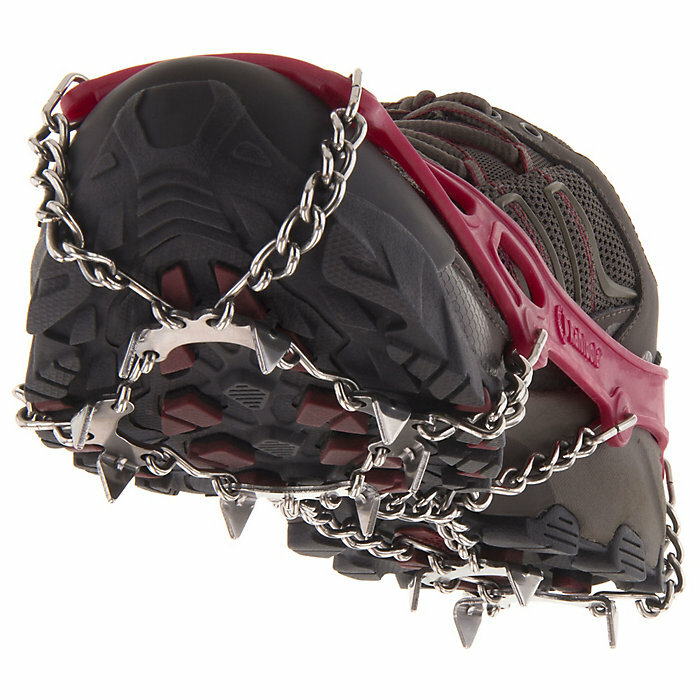 Keep the spikes off until the ground gets too slippery and then fasten them onto your shoes. If the spikes were built in, then you would have to carry multiple pairs of shoes, which would definitely be bulkier. They are pretty easy to get on and off, although as stated in the article, the Hillsound trail crampons are a tad more difficult. I personally do not fall very often and have never taken a fall while wearing microspikes. All sports and nature lovers sometimes go beyond the borders of our body to get a step further, we strive to achieve more and more goals, and in order to succeed, it is necessary to have adequate equipment. It is necessary to analyze the equipment for certain conditions in detail, it will certainly be helpful, thanks for the advice and instructions. Hi, this is an excellent article and a very informative review about microspikes for hiking. I don’t necessarily have hiking experience, but I love to travel in hilly areas sometimes. I feel like microspikes could help me when I’m traveling in rough and wet land. I have sport boots but I think I might need some microspikes for rough situations. I am planning to buy one of these soon. Thanks for sharing these helpful tips. Hello there! Microspikes can be very helpful in any circumstance in which you need a bit of extra traction. Just remember that if you plan on using them for conditions other than snow or ice, like rocky talus slopes, it may cause the spikes to wear down faster. Hi! Yeah! I have immediately pictured the times I have fallen backwards on slippery surfaces while on a outdoor winter travel. Thank you for describing all of these three. And based on your description, I really need microspikes. I’ll follow your advice and choose the Hillsound Trail Crampons. I appreciate the ergonomic plate system you have mentioned linked to these. And I’ll take advantage of the discount on Moosejaw. Glad my article was able to help you out. Please come back and let us know your personal experience after purchasing your spikes! Thanks for this great article. This is the first time I have heard this term.I have been dodging winter for the last few years, vacationing where it is warm year round but I sure could have used these in my younger day. These would be great for my daughter as she lives in the snow belt back in Canada.This would be an interesting Christmas present, wouldn’t it? The prices are very reasonable for the quality you are describing. Finally, a decent review that isn’t all salesy and gives me a legit rating on some new spikes. Being an avid backpacker myself I always find it tough when researching outdoor equipment to filter out the crap. You’ve provided a really detailed discussion on the different brands here and I really enjoy your perspective. One of my goals for next winter is to hike a pretty high elevation volcano in Chile. As you can imagine, the temp swings can be pretty serious in this kind of climate. Although typically it would be a snow shoeing/cross country skiing endeavor I want to make sure I’m prepared for the sleet and ice that might come. I didn’t have any microspikes this winter and it definitely came back to bite my on some of my multi-day trips. The bargain links are also super appreciated! I’ll grab a set within the next few days. If you see any reason not to use microspikes on this trip, please chime in! Thanks again for making my research easy! I don’t know the specifics on what conditions you will encounter on your Chile trip (it sounds amazing by the way) but if you think there could be ice it’s not a bad idea to take some spikes with you. They are small and fairly light so if you’ve got room and don’t mind carrying a few extra ounces I say go for it. I love the name of your website. Walking up hills in the winter is something I do not think much of. I live in Curacao, the Caribbean and we do not have mountains nor snow. I imagine that when it is cold I stay inside, with something hot to drink. But I imagine that for some people walking in ice and snow, hill/mountain up and down can be fun. It is a good exercise anyway. You explain very clearly how to choose the right gear to do this. I was not aware of the gear and all the differences. Thanks for the info. I can understand not wanting to be in the cold. However, if you have the right gear, cold weather adventures can be magical! Check out this post about how snow hiking can change your life. 🙂 Maybe it will convince you to visit somewhere cold and try it out someday. Hi Mariah, I love your site pictures, well done!! !, the information presented is very complete, I don’t usually go out on winter hiking but I do have friends who definitively would love to get information on these items, I prefer going skiing, so if you have some information on good skies, please post it and I will for sure take a look. I hope you continue posting great visual information, thank you. I agree there are certain conditions year round that could warrant the use of spikes. I personally tend to only use them in the winter though. Hi; I have read through your article on the best Microspikes for hiking. And I found it helpful for many who traverse hilly terrain during the winter season as well as those traveling slopes during raining seasons. I looked at The images and got a full understanding of how these Spikes are attached to the footwear and see for myself that attaching Spikes to one’s boots during these seasons is safe. Hey Mariah, nice Article on Microspikes. The whole time while reading this article I couldn’t help but thinking that Microspikes are very similar to snowtires. I don’t really live in a climate that requires these and I actively avoid the cold but it is good to know a product like this exists should I need it in the future. Hi Marvin! You are absolutely right microspikes are like snow tires, or possibly more like snow chains, for your feet.